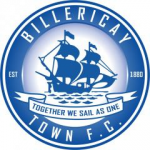 Billericay slipped to their third successive defeat in a 2-1 away reverse to Slough Town. In a match disrupted by very windy conditions, a fine goal from Moses Emmanuel on the stroke of half-time levelled the scores after Matt Lench had earlier fired the home side into the lead. The match was decided by a second half penalty converted by the Rebels veteran forward, Manny Williams, after a Ross Lafayette handball. A red card for striker, Jake Robinson, completed a miserable afternoon. 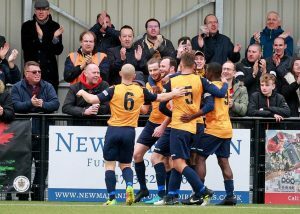 The visit to Berkshire offered travelling fans the chance to sample facilities on offer at the 2,000 capacity Arbour Park Stadium, home of Slough Town. The £8.4m community sports project provides top class sporting infrastructure, including 3G pitch, and construction incorporated provision of a four court sports hall for an adjacent school. Ending a somewhat nomadic existence, and bringing the Rebels back to the borough after a decade long absence, Slough returned to play their first game at their new home in August 2016. A well stocked bar in the impressive glass fronted clubhouse, located in the main stand, offered a birds eye view of the pitch. For the unadventurous, it was tempting to remain inside to avoid the biting cold, swirling wind that would make playing conditions so difficult to negotiate. After a switch to 3-5-2 versus Torquay United, Billericay reverted to the usual 4-2-3-1 used by manager, Harry Wheeler, in previous matches. Three changes to the starting line up were made, including a completely new pairing in the centre of the Blues defence. Constrained in selection by the beginning of defender Charlie Wassmer’s suspension after receiving a four match ban for a sending off against Torquay United, ex-St. Mirren centre-back, Cole Kpekawa, came in as his replacement. Preferring the experience of Lloyd Doyley, over Colchester United loanee Paul Rooney, the ex-Watford man slotted in alongside the debutant. Kieron Cadogan made way for the extra centre-back, retreating to the bench. Moses Emmanuel graduated from the bench to take a berth on the right flank in place of Alfie Potter. Slough aligned in the 4-3-3 set-up favoured by the joint management team of Neil Baker and Jon Underwood. Three changes were made to the starting X1. On loan from Billericay Town, midfielder Billy Clifford was ineligible to feature and was replaced by Lench. Williams moved up from the bench to come in for Simon Dunn, suffering from an ankle injury sustained in a mid-week friendly match versus Thatcham United. With striker Chris Flood having to make his final outing for the Rebels the previous Saturday due to work commitments, 19 year old Francis Amartey earned a start for his stunning strike against Concord after coming on as a substitute. With the wind behind them providing momentum, the home side immediately went on the attack. Clever use of the flighted ball to the flanks would present a first opportunity for the returning Lench. Back at the club in January after being released over the summer for “non-footballing reasons”, time spent on the periphery at Wealdstone had provided the incentive to return to a setting where the previous season at Step three football he had accumulated 51 appearances and 15 goals. Looking a lively presence throughout, Slough’s prodigal son would cut inside from his left side berth on 4 minutes and see his strike deflected for a first corner. Rebels’ pressure led to a flurry of corners, which yielded a good opportunity in the 10th minute. As the ball was sent over by Lench, home skipper Sam Togwell nodded on to change the trajectory and find Manny Williams in space on the edge of the area. 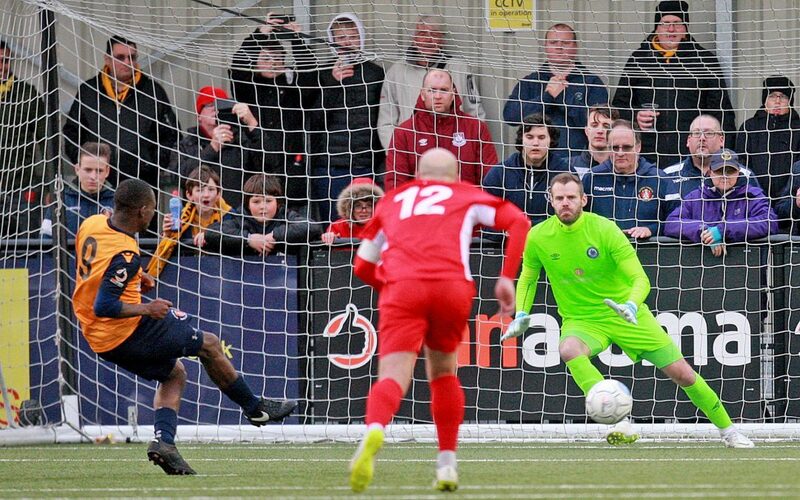 His instant drive into the corner beat Billericay goalkeeper Alan Julian but was hacked away to safety by striker, Lafayette, defending on the goal line. The visitors were firmly under the cosh at this stage as Slough, aided by the wind, continued with a constant bombardment of balls into the box. Billericay started to offer some threat of their own as the team got the measure of the conditions. The Blues first shot on target came on 17 minutes from Robinson who wriggled free of the defence and found himself one-on-one with the goalkeeper. Electing to lob his on-rushing opponent, the ball lacked sufficient elevation and Jack Turner stretched high to claw away the goal bound effort. A Blues corner presented a welcome diversion from Slough pressure but would come to naught as Kpekawa volleyed over when well placed. After good work from Michee Efete, Emmanuel would take possession of the ball inside the penalty area but could only fire off a shot straight at Turner. Throughout the match, Slough’s long throws, sent in by central defender Guy Hollis, caused the visiting defence no end of problems. 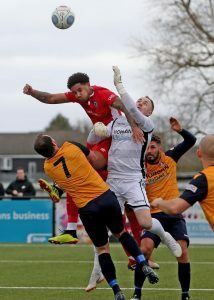 Despite the height advantage for Billericay in defensive areas, which ensured initial headed clearances were made, the second ball was increasingly falling in favour of the home side. On 32 minutes, Slough went in front through Lench, who profited from a poor clearance from a Hollis long throw. Picking up possession on the edge of the penalty area, the attacking midfielder had time to drive home a low shot into the far corner to give his side the lead that their early pressure merited. Just two minutes later, it could have been worse for the visitors as another long throw was cleared to right winger Warren Harris who struck the post on 34 minutes with an 18 yard shot. Rebounding at speed to Williams, the Slough striker could not apply the requisite finish, lifting the ball well over the bar from close range. With the break approaching, Billericay equalised with a stunning goal that came out of the blue. It would need something special to beat the excellent Turner in the Slough goal and that is what was provided. Just inside the opposition half of the pitch, Danny Waldren intercepted a stray clearance from the home defence. Looking up, he sent a superb, flighted ball into the penalty area. Running beyond his marker, Emmanuel volleyed the cross back into the far corner of the net for his 18th goal of the season. 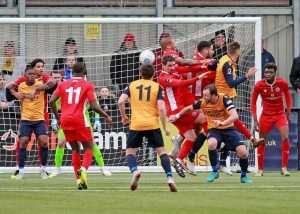 In the second half, momentum switched to Billericay who, with the confidence boosters of the equaliser and the wind behind them, started strongly. Pressure from Lafayette saw a free kick awarded just outside the Slough penalty area. Struck sweetly by Robinson, the resultant set piece would evade the defensive wall and demand a low, diving stop from Turner, pulling off his best save of the match. Loza and Emmanuel threated intermittently down their respective flanks but were unable to create clear-cut chances. Seeking inspiration, Billericay made their first change in the 64th minute, bringing on assistant manager, Jamie O’Hara for Waldren. Once more, Billericay would fall victim to the curse of the long throw propelled into the penalty box. Slipping to the floor, Lafayette would see the ball strike his hand whilst sat on the ground, offering the referee the opportunity to signal the spot kick. With the wind continuing to gust, it took some time to place the ball on the spot. With a three step run-up, Williams slotted the ball to Julian’s left and into the net to put Slough in front. With the Rebels having a reputation for a tight defence, having only conceded an average of one goal per game in the National South this campaign, the clumsy penalty concession had the look of a potentially fatal blow. 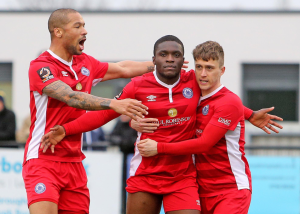 Having endured a testing start to his Billericay career as part of a defence under sustained pressure in the first half, Kpekawa settled into the game and used his aerial ability well to clear danger. On 74 minutes, he was on hand to tackle Harris as he evaded Efete and advanced on goal ready to shoot. Given the success of Wassmer since he joined the Blues in January, Kpekawa has big boots to fill during the ex-Maidstone man’s suspension. However, Kpekawa has made a respectable start at the Essex side. 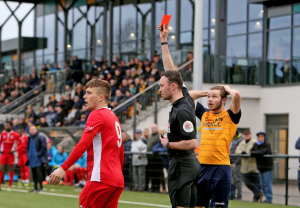 The Blues day would get worse in the 78th minute as an incident that began with Loza being tackled deep in Slough territory ended with a sending off for Robinson. With the Jamaican winger reacting to a late kick from Hollis after he felt that the ball had gone, Robinson appeared to be caught in the melee of both sets of players whilst seeking to act as peace-maker and prevent Loza from seeking retribution. The red card appears harsh if it was awarded for violent conduct as nothing more serious than the displacement of Lench’s hairband appears to have taken place. 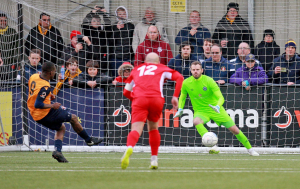 Unless the dismissal is related to something that was said, Billericay are expected to seek to appeal the sanction applied at Slough to their leading striker. Reduced to ten men, Wheeler made his last throw of the dice in the 81st minute by introducing Cadogan for Doyley and switching to a back three. Pushing forward, Emmanuel would beat a defender only to see a well struck cross-shot saved by Turner on 84 minutes. In response, Julian was forced into a diving stop to his right as Amartey fired on goal in the closing stages. With time almost gone, one last chance for Billericay saw Lafayette climb above his marker to meet a Howells cross. The header from six yards unfortunately lacked power and direction, landing comfortably in the arms of Turner in the centre of the goal, as Slough held on for victory. 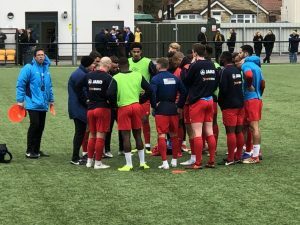 After an early surge under Wheeler, three defeats in a row for Billericay, including away losses to basement battlers, East Thurrock, and mid-table Slough Town has dampened thoughts of a late run at the title and begun to exert some pressure to achieve results to keep the play off aspirations alive and well. For now, three points separate the Blues from closest challengers, Concord Rangers, which means that getting back to winning ways at home against Hungerford Town is vital. Key concern at present is the tendency to over-use the long ball as a solution and lack of threat in the final third despite the presence of attacking players in the line-up. With seven matches remaining, Blues need to find a way to combine their increased defensive resilience with sufficient attacking momentum to increase their goal threat. Subs Not Used: 12. Sean Fraser 14. Simon Dunn 15. Louis Soares 16. Dan Roberts 17. Trent Philips, GK.